Barefoot running is more natural, the argument goes. I say it nearly killed my feet and joints. Whenever I get into discussions about barefoot running, its proponents usually come up with an argument straight from Christopher McDougall’s book Born to Run : we didn’t evolve to wear running shoes. I can’t argue with that. However, we also didn’t evolve to run on pavement, did we? The first paved road appeared about 2,500 years ago, but our feet are the product of an evolution that lasted hundreds of thousands of years. As far as Mother Nature is concerned, pavement happened a second ago and evolutionary adaptions to environmental changes take a long, long time. But forget the theoretical, I tried barefoot running out. Or better, what passes as barefoot running these days, thanks to McDougall’s book, where he frequently mentions them: I put on Vibram FiveFingers. 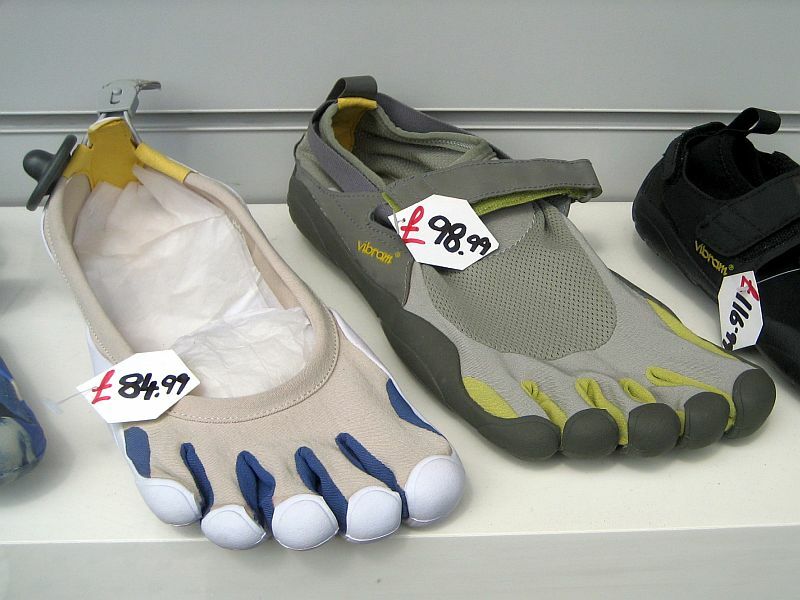 These basically aren’t shoes, but gloves you put on your feet and all they protect you from is making direct contact with pieces of glass, dog turd or the other pleasantries found on paths. No shock absorbing or all the other stuff regular running shoes are sold with. My usual running route involves sidewalks, a bit of an old paved road, a dirt track and then back again, so I had most of the grounds covered that many runners encounter. How did it go with the Vibrams? On stone-covered sidewalks and the paved road it was pure hell. Whenever I touched down, it felt like my heel sent a shock wave through my knee, up the spine and into my skull. It was as if someone beat me on the head with a hammer, just from the opposite direction. To be able to run with the Vibrams at all under these circumstances, I had to touch down with the front of the foot first, which made for a very awkward and tiring gait. On dirt things were better, as the more elastic ground provided some cushioning, but still far from what I would consider comfortable. This part of the experience was somewhat comparable to when I did some real barefoot running on a beach. With the difference that really bare feet combined with wet sand are a much more pleasurable combination. You could of course argue that my feet are too pampered for this style of running. Or that some of their muscles are too “atrophied” to do what evolution meant them to do. McDougall does so frequently in his book. However, where I run, I often see the same runners, and some wear Vibrams. A number of those apparently have done it for months or even years, but still do what I now identify as the “Vibram gait.” I’d have never recognized this tenderly touching down if didn’t have to do it myself. If they hadn’t got used to it after all that time, I wondered, will they ever? If you now called me out for just presenting anecdotal evidence you would be right. But in his book McDougall does much the same, just in the opposite direction, because there is little else. When it comes to science, he can only point us at studies showing negative effects of wearing running shoes and invite us to assume that the absence of similar evidence concerning barefoot running means it is superior. The truth is that substantial scientific evidence for or against barefoot running simply can’t exist yet. People have been wearing running shoes for decades and a lot of research has been devoted to it, while most who now do barefoot running have done it only since 2009 – the year Born to Run was published. If people keep it up, what will we learn of the longterm effects by 2019? The few studies that already examined it now actually don’t paint a rosy picture. My recommendation remains to get a shoe that fits your foot and style of running and if you want to try out barefoot running, do it on natural and softer surfaces. Evolution, in my opinion, simply couldn’t take concrete into account. If you already tried barefoot running, let me know your experiences. Was it as awkward as it was for me? Did you get used to it and how long did it take? Pictures courtesy of Marc Levin and “Abulic Monkey“. I wear the Vibrams for body weight exercises and any backyard sports like badminton, tree climbing, water fights and other mischief. They grip really well, you can pivot better and water isn’t a big issue. I wouldn’t run in them. I’m really not that interested in spending the time to learn how to run in them and I really can’t see them on gravel or cement. If other people love them for that I say good then they will still be available in the store when I wreck mine and need a new pair. Good points, Cindy! Under those circumstances I can see that they give some advantages due to the direct feedback you get. I haven’t even bothered to try. They are really expensive shoes and I would be really surprised if I actually enjoyed them. I’ve stress fractured both my feet in the past and had other foot injuries and I need the support of shoes! I agree evolution takes a long time, and concrete is hard! Yup, look at those price tags. Funny that a shoe that boasts about its simplicity costs more than many elaborately bult regular shoes. Never heel strike while running no matter what shoes you are wearing! It the main cause of plantar faciitis in runners. Studies show that some cushioning with midfoot striking is the best way to go. I think it’s a good idea to be barefoot as much as we can. Run that way on grass. Walk that way around the house. I don’t strike down hard with the heel and actually do the rolling motion that supposedly works best, but in the FiveFingers even that hurt. Not quite sure barefoot running is better, however I’m quite sure that “more natural” (non excessive cushioning, minimal drop) running is better. See Dr. J’s explanation, but there’s enen more. I personally always hated any kind of heels. I never really liked running shoes either. I just find the feeling of walking on pate-de-fois-gras a bit creepy, you know. Only later I discovered that the pate has even some heel. Oh well… So I spend most of my non-summer time in Puma (Insert stupid adjective)cat sneakers, a.k.a. car-racing shoes. I have been into martial arts most of my life. And I always liked the barefoot running around the gym during the warm up. Funny enough I alway hated running outdoors. Never considered the contradiction until a couple of years ago when I bought a pair of “barefoot” Merrells during the summer sales (I was searching for the Pumas…) and tried to jog one day. And guess what, I liked it! I soon discovered their limitations, though. Gravel and off-road is just a no-go. But they are awesome for concrete, wood-paths, walking in general and going to the gym. So at 30+ I am slowly turning into a jogger or something. Not a barefoot one, but one who choses nearly zero-drop shoes with little cushioning. I just love gravel and off-road to much, he he. Anthropological note: The barefoot hype is indeed quite annoying, especialy when linked to the paleotard movement. However, over here I am noticing more and more also the opposite extreme. Some people tend to wear mountain boots just anytime they fancy to climb something that is higher that their couch. And mountain boots are just a tad better than skiing boots which are basicaly on a plaster-case level. The middle ground is apparently just too boring. Thank you! Very good points you added! Indeed some shoes are cushioned so much that they cause more damage than good. I’ve moved toward minimal shoes, and by doing very gradually (only short runs at first), I have had no problems whatsoever. I also try to run on gravel. Please let me know how that works out on gravel. That is one ground I didn’t run on with them.